It seemed like quite a good idea back in May when he first mentioned it. 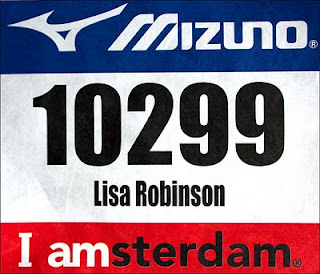 I knew I wanted to try running a marathon one day, so I decided to sign up too (on the back of being able to jog 2 miles in less than 30 mins). Training started pretty well - I built up to running 5/6 miles continuously, taking an hour or so to do it, and I was quite pleased with myself. But I didn't go out as often as I planned, often only managing one run in a week. And our holiday got in the way. Then work and social engagements. To be honest, I simply didn't put enough time aside or make enough sacrifices for it. With about 3 weeks to go I was really worried. The longest I had run continuously was 2:30, and I'm a slow jogger so that was only about 10/11 miles. I had no idea if I was going to make it round at all. So we arrived in Amsterdam on Friday evening. We'd managed dinner at Heathrow, which meant we could flop into our beds as soon as we arrived at the hotel. 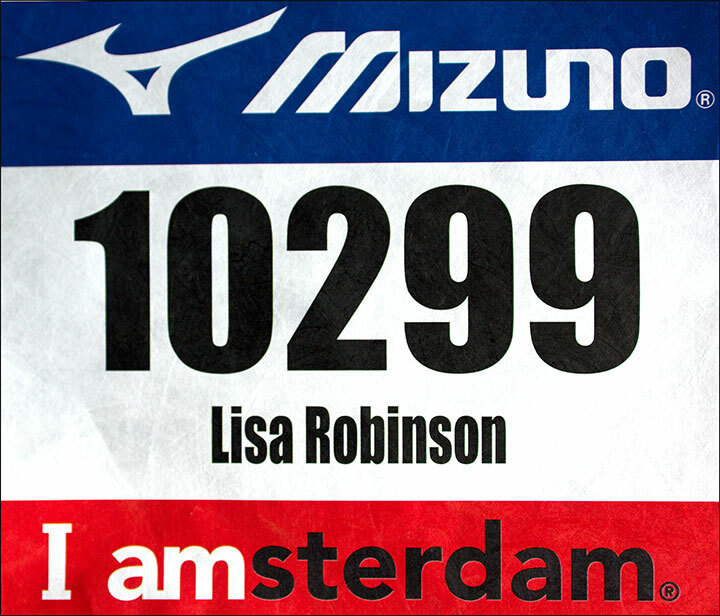 Saturday was a strange day - we collected our chips and numbers from the stadium, where we observed lots of very fit, very serious looking runners. Hmmm... Then we managed a little light sight-seeing (the trams in Amsterdam are fantastic) and enjoyed a steak dinner before retiring for the night. After all the faffing of getting organised, wearing the right gear, packing a bag with the rest if the gear, attaching numbers, dropping bags off, etc, we finally found ourselves in the stadium, ready to start. We were both in the last section (expected time 4:30+). My expected time was "I want to finish and not be picked up by the sweeper bus after 6 hours"! We shuffled around the track after the faster runners, and finally set off about 12 minutes after the elite athletes. And I was at the back. The last of 10,000+ people at the start of 26ish miles. I almost stopped straight away. Seriously - 400m into my marathon and I nearly stopped. We had joked about me being slow and being near the back, but I never actually expected it! However, I somehow managed to persuade myself that I could probably overtake a few people and the experience might turn out to be bearable, so I plodded on. I actually rather enjoyed 1k-10k. I did overtake about 10 other runners, and I was feeling pretty strong. I even started to think I could do it. It helped that there was a cross-over point where the faster runners were running on the other side if the road. I saw the 4:00 and 4:15 pacemakers and scoured the hoards for my OH - he actually spotted me first! I was so glad to see him looking strong that it gave me a boost! Around 15k I realised that I was going to have to walk some of the way. I persuaded myself to wait until 21k (halfway), but gave in a short while later and walked for a few mins at 17k. The canal seemed to be going on forever and the few people I'd overtaken were starting to overtake me again. At 20k I walked again, passing through an all-but-packed-up water station, the sense of dread filling me. I wasn't going to make it. I hadn't trained enough and I was going to get picked up by the bus. I really thought it was over. I alternated running and walking the next few km and gained a new friend in Melba - a Colombian lady who was on her 8th or 11th marathon (it was a bit hard to understand as she spoke Spanish, French and Dutch better than she spoke English, which she still spoke better than my Spanish!). She had a odd method of running involving shuffling her feet along the floor, but she was friendly and determined to finish and really spurred me on. By 27k I seriously couldn't run - my thighs felt like lead. I was using my Garmin pace information to try to walk as quickly as I could, calculating that I could just make 6 hours if I kept good pace. Both hurry-up vans had past us - the second one ignored us, as if they didn't even notice that we were part of the race. And then a motorbike appeared. He asked if we were alright, then warned us that the half-marathon was coming through! We stayed as close to the side of the path as possible as another load of runners started sprinting past. Melba started to look like she wanted to run, so I encouraged her to head off. I was on my own again, although this time with thousands of much, much fitter and faster people streaming by. The next water station was a nightmare! I tried so hard to stay out of the way, but it wasn't working. I ended up pushed, shoved and with water and energy drink all down my legs. Then I caught up with a very nice Irish bloke who had had his knee bandaged at 16k and was still walking. We had a lovely chat for about 10 mins which took my mind off my failure and his mind off the pain in his knee. Then I had to leave him as I needed to be walking faster. On the bright side, there were now crowds, other racers and fully operational water stops. On the downside, I was walking along at about 13 min miles, with hundreds of people passing me. I tried my hardest to stay at the edge of the path, away from the blue line, but occasionally the line would swap sides and I'd be in exactly the wrong place again. One poor man fell over, banging my leg as he went, but got up and carried on. At the next water station I went the wrong side of the stalls to stay out of the way. I can't tell you how I was feeling, only that I was depressed that I couldn't run and determined to see OH at the stadium. Right near the end, I met another friend - Nathan from Holland. He also had a knee injury and was wincing every time he put his foot down. We talked for the last couple of km and then jogged for about 600m to finish the race. Nathan beat me. I wasn't particularly excited or pleased to be finished, I just wanted my medal and to see my OH. 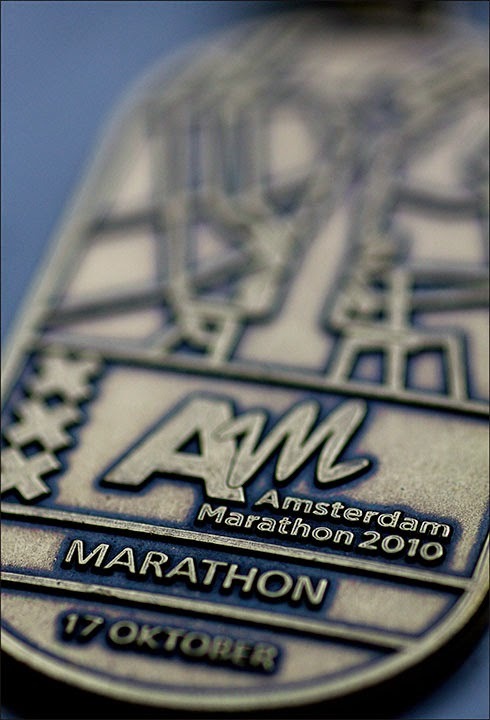 The man at the medal stand tried joking with me that they weren't giving medals to people who finished outside 6hours. I nearly cried, shouted and possibly hit him! He seemed a nice enough chap, but it's not a good idea to joke with someone who has spent 6 hours exhausting themselves! And then I found my OH and everything was alright. I think he was more chuffed than I was about me finishing! It was a lovely moment. Will I do it again? Probably. I want to actually do it properly with the proper amount of training. But let's wait and see before I make any grand plans. 6:06. 7877th out of 7878. 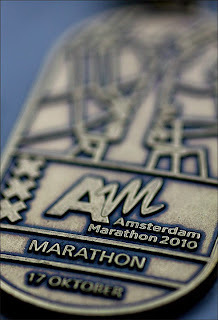 But I finished a marathon, and that's still something to be proud of.